Below is an interview with Jimmy Anderson, a candidate running to represent Assembly District 47 in the state of Wisconsin. In the past we hosted Twitter chats with various disabled and Deaf candidates such as Carrie Ann Lucas, Jen Longdon, and Chris Haulmark. Photo of Jimmy Anderson, a young, half Hispanic, half white man with short brown hair. He is sitting in a power chair with a long-sleeved blue and white striped shirt and khaki pants. Behind him is a green lawn, a home and tree. He is smiling at the camera. Let’s see, I grew up in a small town in California called Patterson. We are the apricot capital of the world! I then went to Cal State Monterey Bay for undergrad and loved spending four years getting to see the ocean every day. I got a job at a small law firm doing clerical work and found that I had a passion for our legal system. I then went to law school at the University of Wisconsin in Madison where I focused on business and tax law. I love animals of all kinds, I enjoy watching sports, going to the movies, and I make a real effort to read a book a week. My real hobby is writing screenplays; I know they are probably awful but we all need an artistic outlet, right? Why did you decide to run for Assembly member representing District 47 in Wisconsin? It was in 2010 when a drunk driver took the lives of my mom, dad and little brother, and left me paralyzed from the chest down. It was a horrific accident and I struggled to see how I could go on. To make matters even worse, just after my spinal fusion surgery, my health insurance company tried to kick me off my plan. I was terrified because I had no way to pay for my rehabilitation or my wheelchair if I didn’t have insurance. Luckily, just a few days later, the provisions of the Affordable Care Act kicked in that eliminated lifetime caps. I can’t express how relieved I felt. It allowed me to begin the process of piecing my life back together. Quite literally, the ACA saved me. I wasn’t very political before that day but going through that whole experience made me realize how important it is to fight for the things you believe in, especially when it comes to providing quality healthcare for everyone. No one should have to go through what I went through. My decision to run for office was a way for me to pay back the people who fought to save my life. I owe it to them to carry on the torch and help make a difference in my community and my state. I can only hope, when it is all said and done, and I get to see my family again, that they are proud of the world I leave behind. What are some of the major issues in your platform? Healthcare is my primary focus. While the ACA was a good first step, there is still so much work to be done. I have a whole series of bills that look to make healthcare more accessible, more affordable, and more responsive to the needs of the patient. My package of health care bills supports expanding services in rural Wisconsin, preventing surprise out-of-network billing, capping charges on the uninsured, expanding access to women’s health care, and so much more. I also have quite a few ideas that can make a difference at the federal level if I ever get the chance to serve in Congress. My district also shares my passion for protecting the environment. That means improving water quality, conserving our lakes and wetlands, doing more to expand our public lands, and taking seriously our air quality standards. Even though we are only one state, we have a serious responsibility to curb climate change. That means moving to 100% renewable energy, tackling carbon emissions whether they come from cars or cows, and being prepared for the increase in catastrophic weather events like the flooding that has devastated so much of the Midwest. I’m also a dedicated progressive, for all that it means. We have to fight for the ideas that we believe will make our country a decent and humane place to live. And yes, that means we have to significantly invest in our country again and do what it takes to address income and wealth inequality. How is the campaign going so far and what have you learned while reaching out to voters and the public? When I first ran for office, I knocked on thousands of doors and what I learned is that we are all pretty much the same. Our lives are complicated and stressful; we all wish we had more time for the people we love. We care about leaving a better world for the next generation. We also seem hungry for leaders who are authentic, solutions oriented and willing to fight for what they believe in. Having finished my first term in office, I have come to learn that the hardest thing to do is community organizing. What I want more than anything is to build a unified community of the disabled and their supporters. We are one of the largest minority communities in the United States, but because we are not organized, our concerns are often ignored. As I start my second term, I want to continue my work building our community and doing more to support disabled candidates running for office because representation matters. Whether it is a financial contribution or volunteer time or even just helping to amplify a message on social media, we have to support one another to grow our political power. Have you encountered any barriers or challenges as a disabled candidate? 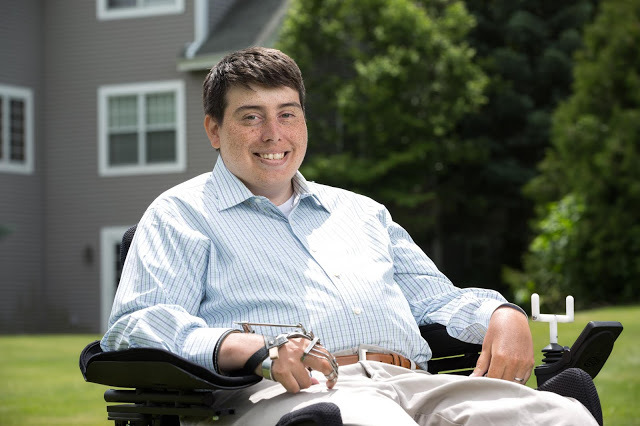 When it comes to running for office, there will undoubtedly be many physical and logistical barriers, but as any disabled person knows, our whole lives are about overcoming or working around obstacles. When I was knocking on doors in the district, there were some houses that were completely inaccessible. To address this, I brought my campaign manager along with me to knock on the doors I couldn’t. That’s why I think it is so important to have a few people in your corner who are passionate about your candidacy. Campaigns are long and difficult, so you need people to rely on when you need a helping hand. It has been just as difficult serving in office as a disabled person. While there are not as many physical barriers, my Republican colleagues in the state legislature have not been accommodating. They have denied my requests for reasonable scheduling periods for committee hearings and floor votes, not to mention the lack of alternative attendance options. It has been incredibly frustrating being denied the opportunity to fully participate in the legislative process but I am dedicated to fixing these problems, not just for myself, but for anyone with a disability interested in running for office. What is unique about Dane Country and the needs of this community? Dane County is a progressive community that cares about one another. It is such a special place to live. We not only have the state capitol but a world-renowned University and some of the most beautiful public parks in the country. We are growing at a significant pace which comes with some unique challenges. Transportation, whether it is maintaining our roads or doing more to develop public transit options, is a growing problem. We also have a significant need for more affordable housing especially for younger people. Unfortunately, a lot of smart policy proposals are dead in the water because Republicans have used gerrymandering and voter suppression to cement a majority in the legislature. Despite winning more votes statewide, Democrats barely hold a third of the seats. It’s antidemocratic and unfair. Many of my constituents feel resigned because their government completely ignores them. I can only hope that 2020 is a strong year for Democrats so that we can pass independent redistricting reform and ensure our legislature actually reflects the voters of our state. What are your thoughts about the wave of people engaging politically for the first time in the last few years? Why is civic and political participation important? I think it is so great that people are getting involved who are new to politics. When officeholders serve for too long, they often lose touch with their constituents and end up captured by lobbyists and special interests. It’s this new wave who is coming up with innovative solutions when it comes to policy and demanding more from those running for office. Most interestingly, they are changing how we communicate with the public and developing new ways to organize at the grassroots level. From my own experience, I have learned how important it is to have people from all walks of life represented in office. There have been numerous times where my experience as a disabled person has given me a unique insight into a piece of legislation and allowed me to advocate for changes to the bill to make it more inclusive. If I wasn’t in the room, these problems would’ve gone unnoticed, not because my colleagues are bad people, but because they don’t live their life in a wheelchair. They are just unaware. This is why we have to organize and support disabled candidates. That means offering to volunteer your time, or amplify their message on social media, or most importantly, being willing to donate to their campaigns. We need more people like us in the room making decisions. It is the best way to create positive change in our lives. What is your advice to disabled people who are interested in running for office? Go for it! Begin by reaching out to individuals in your community who have run for office or have helped others run for office. They can give you all the information you need on what you should expect when it comes to running for office and serving your potential constituents. Also, be ready to put in the work. The reality is that running for office as a disabled person is going to be more difficult. You have to outwork your competitors: knock on more doors, make more phone calls, just do everything you can to get ahead. For many local and state races, the person who wins is typically the person who puts in more work. And lastly, don’t wait your turn. No one is entitled to their position in elected office. If you believe that you can do a better job and make your community a better place, get out there and tell folks just that. Be unafraid! Share your vision and inspire people to support you. And when you win, do not be cowed by your new colleagues. Maintain your bold spirit and fight for progress at every turn. Is there anything else you'd like to share with me about your campaign? Support for some kind of universal healthcare system has grown to the point where “Medicare For All” promises to be a major campaign issue in the upcoming 2020 Elections. What does this mean for people with disabilities? Joining us for this chat is Matthew Cortland, a disabled writer, lawyer, and public health nerd. This is obviously a huge topic that provokes a lot of feeling and debate in the disability community. Our aim in this chat isn’t to decide which plans or strategies disabled people should support, or to pick which plans and candidates are good and bad. Instead, we hope to clarify the terms of the ongoing debate, map out the specific concerns of disabled people, and hear about people’s experiences attempting to discuss and advocate “Medicare For All” type proposals from a disability perspective. “We read Democrats’ 9 plans for expanding health care. Here’s how they work.” Sarah Kliff and Dylan Scott, March 20, 2019, Vox.com. “‘Medicare for All’ Must Truly Be for All—Including People With Disabilities,” Robyn Powell, March 13, 2019, Rewire News. “Sanders’ ‘Medicare for All’ expands long-term care benefits,” Ricardo Alonso-Zaldivar, March 8, 2019, Associated Press. Follow @GreggBeratan @AndrewPulrang @DisVisibility and @mattbc. 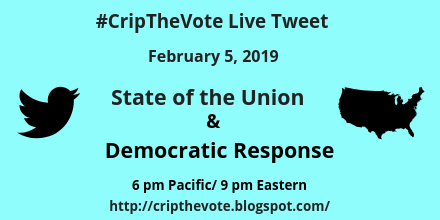 When it’s time for the chat, search #CripTheVote on Twitter for the series of live tweets under the ‘Latest’ tab for the full conversation. 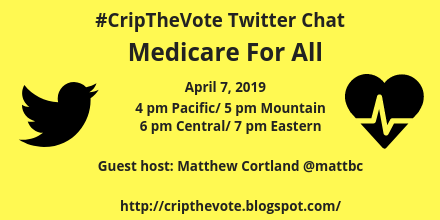 This concludes our #CripTheVote chat on #Medicare4All! Thank you to everyone for joining us today, especially our guest host @mattbc. 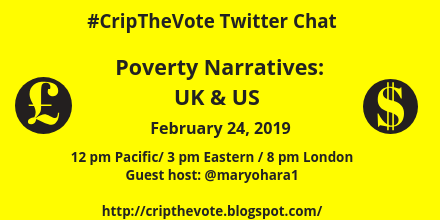 We will discuss the role of poverty narratives on policies and programs in the US and UK with guest host Mary O’Hara, journalist and author of Austerity Bites: A Journey to the Sharp End of Cuts in the UK. Mary will also talk about an organization she founded, Project Twist-It, that is focused on changing and transforming narratives about poverty. Please note: while we will focus on disabled people and poverty in the US and UK, we welcome everyone to participate and share their thoughts about poverty and ableism in their local communities/countries. Follow @GreggBeratan @AndrewPulrang @DisVisibility @maryohara1 and @ProjectTwistIT. 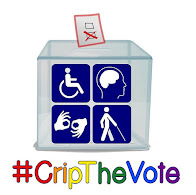 When it’s time for the chat, search #CripTheVote on Twitter for the series of live tweets under the ‘Latest’ tab for the full conversation.